It has been quite awhile since my last bake of a cake with frosting be it with whipped cream (also known as Chantilly cream), buttercream or cream cheese frosting .... Have not made swiss rolls for quite sometime too. 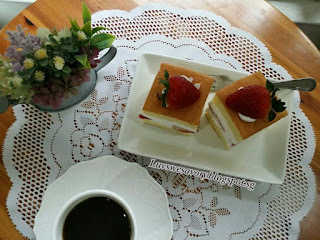 I've bookmarked this easy strawberry shortcake recipe for the longest time. Hee .. hee... somehow, I've lost touch in making a nice even layer of whipped cream >~< ... Resulted an uneven thickness of the 'sandwiched' cream. But we gladly enjoyed these creamy fluffy soft Strawberry Chiffon Shortcake on a quiet and cooling afternoon. 250g Strawberry - washed and pat dry, hulled and sliced into halves. 1) Sift the cake flour and set aside. 2) Line one 25cm x 25cm baking tray with parchment paper. Do not need to grease. Set aside. 3) Preheat the oven to 170ºC. Position the rack in the middle. The temperature of the oven may vary, do adjust the temperature and timing to suit your oven. 5) In a clean mixing bowl, whisk the cold egg whites till foamy using the handheld electric mixer. Gradually add in caster sugar in 3 separate additions and beat till stiff peak, formed into a firm meringue. Chill the meringue in the fridge while preparing the yolk batter. 6) In another mixing bowl, using an electric mixer with whisk attached, cream together the egg yolks and caster sugar until pale and slightly thickened (about 3 - 4 minutes). Add oil, milk and vanilla extract into the egg yolk mixture and whisk till combined. Add the sifted cake flour into the egg yolk mixture and whisk until combined. 7) Using a hand whisk or a spatula, gently fold in the meringue to the egg yolks mixture in 3 batches until it looks evenly mixed (no streaks of meringue). 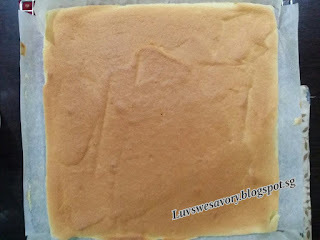 8) Pour batter into the prepared baking tray. Smooth the top evenly with a scraper or spatula. Lightly tap the pan 2 - 3 times on a table top to get rid of any trapped air bubbles in the batter. 10) Remove the baking tray from the oven, immediately drop the baking tray at a height of 20 - 30cm onto a table top. This action helps to keep the springy texture of the sponge when it is left to cool. Remove cake (with its baking paper) from the tray onto a wire rack to cool. Flip the cake (skin side) onto a clean sheet of parchment paper. Peel off the lining paper. Trim the sides of the cake and cut it into half. Freeze the cleaned mixing bowl for about 5 minutes. Take it out from the freezer, immediately put all together the cold whipping cream, vanilla extract and caster sugar in the cold mixing bowl. Use the electric mixer to whisk till stiff peaks form. To assemble, place the half of one cake in a container. 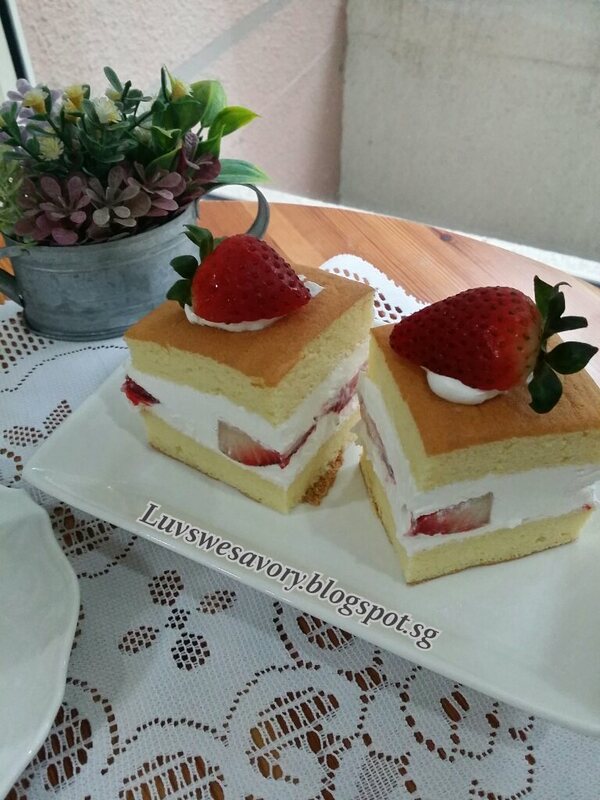 Thinly spread some whipped cream onto the sponge cake. 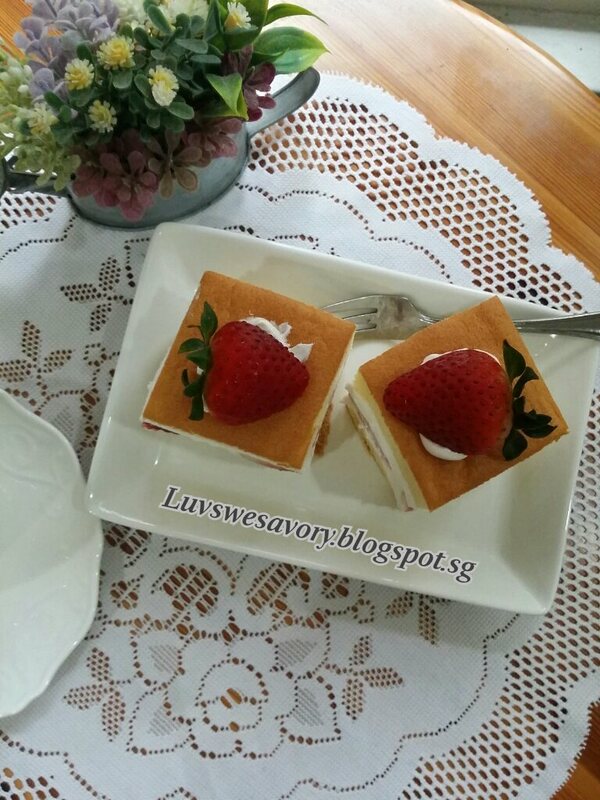 Top with strawberries and cover with more whipped cream. (# reserve about 2 - 3 tablespoonful of whipped cream for cake top decor). 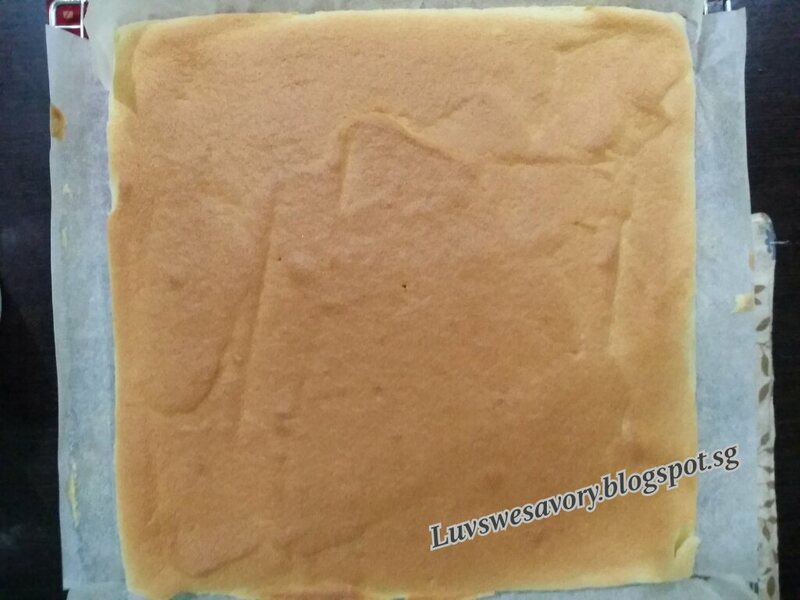 Cover with the other half sponge cake. Cover the container and chill in the refrigerator for about 4 hours to a full day. *Note: I placed the cake in a container that could just fit the size. To serve, cut into any shape of your choice, spread a little of the reserved #whipped cream on the cake and top with strawberries. Enjoy and happy baking ! 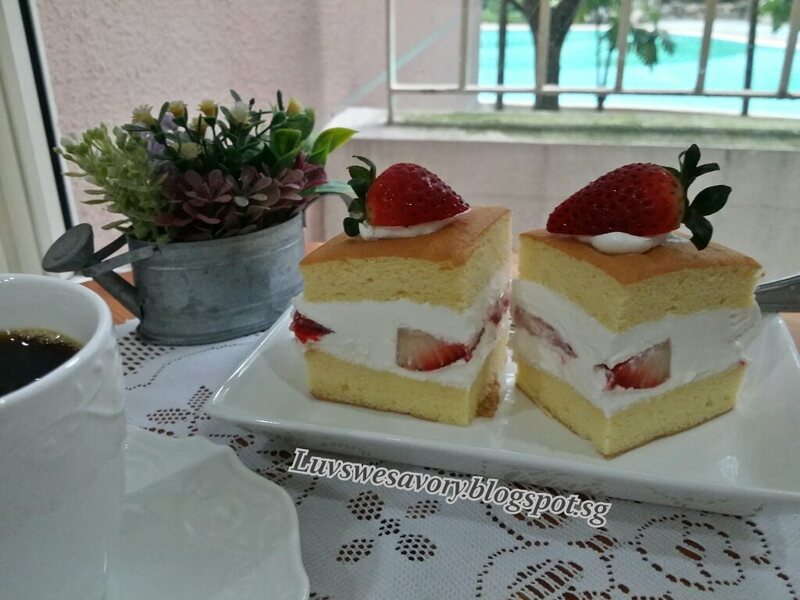 beautiful shortcake Karen, this looks like a dessert my whole family would love. Wow, this looks like it came out of a cake shop, Karen. You are amazing!